“Do not worry. . .” she repeated as she bent over my head, paintbrush in hand and went to work. She was correct – I needn’t have worried. My first visit to a beauty salon in Greece turned out to be perfectly fine. Although for the rest of the day I sported a 'do' that I likened to US newscaster Diane Sawyer's 'do' in the 1980's, the procedures used on me were the same as those of my long-time friend and hairdresser in the States. Then it was done. Check. Another ‘first’ in this ex pat life behind me. Sometimes that little notebook seems to be our cheat sheet to living. It holds phrases, words, names, notes on things like how to order a loaf of bread at the bakery (using Greek words and not pointing) and an oft-used chart of the Greek alphabet and its translation to letters in English. We've found at times the approach to completing a task is so vastly different from what we knew that we don’t think we’ll ever get the hang of ‘it’ - whatever ‘it’ happens to be at that particular moment. Other times they are so remarkably similar that we sail through with the greatest of ease and then chuckle at the similarities; much like the hair appointment. So, how do you live? During our six-week sojourn back on U.S. soil we were often asked about living in a foreign country – not deep soul-searching questions like, “How’s your view of the world changed?” or “How have you changed?” but more questions about day-to-day living here in the rural countryside of the Greek Peloponnese. There is a certain curiosity about living differently. So today I'm answering a few of those questions again . . .
* You have a washer and dryer don’t you? No dryer. Clothes, bedding and towels are hung outside to dry but for a few weeks in deepest, darkest December and early January, when storms and cooler temperatures prevent drying. Summer’s drying time is a couple of hours and other season’s could take a couple of days. *Do you still go to a gym to work out? Are there places near you to walk or jog? There are exercise facilities in Kalamata, the big city an hour to our north, which makes it too far to go to on a daily basis. We do get a workout in the yard and olive grove. Numerous articles have been written about exercising in your garden so we think of ours as our garden gym – and being on a hillside provides a natural ‘StairMaster’ workout. We could ride bikes along the village roads if we were so inclined – we aren’t. And so many paths and walks to be taken in the nearby countryside that we will never get to them all. *Do you cook at home? Is there a supermarket nearby? Some, we think, believe that every night we eat roasted goat and Greek salads at a seafront taverna. Au contraire! Since settling in we eat at home most of the time with one or two dinners out a week. What is nice about shopping here is that we can get items like Italian cheeses for a fraction of the cost we’d have paid in the United States. We also have some great fresh Greek cheeses. On the other hand, I paid nearly 7 euros (about $8.50US) for a small jar of Skippy peanut butter. but when you miss peanut butter, you pay the price – and eat it sparingly. We are testing out our green thumbs this year by expanding our vegetable garden. It isn’t really necessary (thank goodness) as we have municipal markets (think Farmer’s Market) that operate year round in the two cities on either side of us, Kalamata and Areopoli and also have visiting fruit/veggie and fish vendors who sell from their pick ups or vans and who regularly come through the villages. Sometimes we get lucky and the flower vendor comes through town as well, although we have several nurseries nearby. *So do you have water, sewer, garbage like in the States? We do have ‘city water’ at our house; just not quite sure which village provides the municipal water. However its high mineral content makes it undrinkable from the tap (just like our timeshare in Scottsdale, AZ) so drinking water comes from the fountains scattered about the villages. We have a septic tank. We take our garbage to municipal bins located throughout the villages and on the roads between them. From those regular garbage trucks pick up the refuse and deliver it to waste sites. We do have recycling efforts here and bins to separate plastics, paper, metal and glass. But ‘making a water or garbage run’ usually is tied into having a cappuccino or a glass of wine so those 'chores' end up being a treat. Cappuccinos after a garbage run - what a treat! As the weeks have become months, we find ourselves acclimating to our new routines and ways of doing things. Like anyone who’s moved to a new home in a new area, we must think a bit more, be a bit more flexible in our approach to doing thing and celebrate each new ‘first’ that is successfully accomplished in our new surroundings. 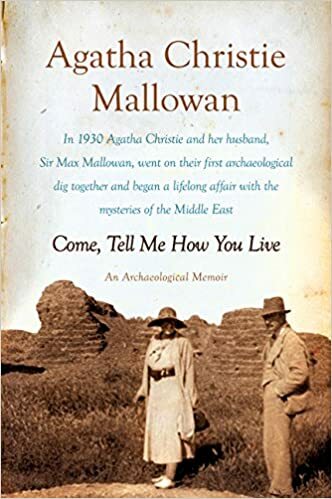 *The title for today’s post is borrowed from one of my favorite reads: an autobiography written by Agatha Christie Mallowan (the Grand Dame of mystery books) that chronicles her life back in the 1930’s when she and her archaeologist husband, Max, lived at ‘dig sites’ in the Middle East. It is a small book but a fun read for those who want to live differently or just want to take an armchair getaway to another place and time. I love your adventures. Thanks for sharing. Travel opens our eyes to so many experiences. Sometimes the simplest things in life can be the most interesting. I am waiting for next week's adventures through your eyes. Well thanks for such a lovely comment, I am glad you are enjoying these every day adventures of ours. Please do keep in touch! Love the post - and your new hairdo! Funny, I miss the adventure of having to figure out daily life in a foreign country. Gotta get back to exploring! I can assure you the 'new do' style at least lasted only until the next morning's shower! I've been loving your San Diego reports -- ever sailing towards Greece?? Having submitted myself to haircuts, dentistry and doctoring in several countries, I can appreciate your apprehension when trying out a new stylist. BTW, she deserves a good tip and I'm assuming you'll be going back many times as the haircut (and picture) is terrific! During our years of slow traveling through various countries and now, living as expats in Portugal, I love seeing how many ways there are to accomplish the same tasks: laundry, garbage disposal, grocery shopping, etc. As small and seemingly remote as your village is, it looks like you have (almost) all the comforts of modern living. And those you don't have (a dryer or door-to-door garbage pick up) you can pretty well do without! Living differently puts a new perspective on 'normal ways of doing things' doesn't it? And I am noticing my perspective changing on many things that are leaving my US friends aflutter. One asked the other day if I was hesitant to use FB in light of recent headlines and I told her not at all. . .it is our source of news around here for events and happenings as well as our link to friends here and back there. It does take getting used to no? I had a really hard time when we first moved there. Most difficult was the shop hours. No supermarkets opened for your convenience seven days a week. Oh and the peanut butter is expensive as is the maple syrup. If you have a Lidl nearby it might be worth it to look at the flyer and stock up on these goodies whenever they have them. Yes, it does Mary. I too am surprised in Kalamata when on a Sunday the large stores are closed. Our supermarket in the village is open every day - Sundays and holidays. Thanks for the tip on Lidl! Hanging clothes seems so very normal here - and I love the fresh air smell they have. Back in the states they have some housing areas where you are forbidden from hanging your clothes as they are considered an eyesore to the neighbors. . .get real!! And the haircut/color was a hurdle - I have to admit I was very nervous. It was so interesting today to read how you live. (I think I would be interested to read that Agatha Christie book). Just little things like having to go and get your drinking water. But as for washing and hanging the clothes on the line, that is the way we have always done it, though it the washing is hung on a "Hills hoist" - I'll let you look up that one. Sounds like you have a slightly slower pace of life, which I often dream for here. Enjoy! I'm sure you will eventually be able to speak like a local! I love the responses to that particular example of living. So many have responded that hanging clothes is normal - and back in our part of the US, they gasp at the thought! It certainly puts a new perspective on the word 'normal'! I remember reading that Agatha Christie book. I was a great fan. Now that I'm old, I should go to the library so that I can re-read her books, particularly this one if they have it. I love your story about hanging clothes outside. When I was young, we had a wringer washing machine, but clothes had to be hung on the line outside. My mother had a system, which she taught me...sheets and blankets go on first, then other large things, then smaller, then smallest, so that they came off in reverse order because the small things often dried first. I love the idea of spreading laundry on a bush to dry but I don't think I've actually done it. Lots of memories — thank you! Kay, I just visited your blog and what a delightful experience that was! I will be back! Hope to see you here again as well. And yes, we too, had a Maytag washer and I learned the proper way of hanging things as well! I really enjoyed this post, Jackie. It made me realize that things that we consider everyday here (like doing dishes or laundry) can take on a whole other personality when you're attempting to do them across the globe. I am so grateful for the amazing water we get from our home's artesian well. I've never had better water. This new adventure has put a new perspective on 'normal' - and what it means when you choose to live differently. Thanks much for the visit, Doreen. I love your Stairmaster! So pretty. Thanks so much -- it is one of my favorite parts of this property! Like your friends and family, I find the differences and similarities in day-to-day living fascinating. Thanks for sharing this. I've had to deal with getting my haircut when travelling for extended periods or wintering somewhere away from home. When you've had the same hairdresser for over 30 years, going to someone new is scary. Less scary now that I've done it a few times. Love your very interesting "tales" with all the practical information. Language must post a formidable barrier. I continue to admire you for your adventurous spirit! Everything you must learn and change about what you are used to and getting to know the locals even with the language barrier. You're awesome! I am so looking forward now to our slow travel beginning next year. How we will take the new normal just like you have just described your Greek adventure.